Because of my positive experience, I could never understand homeschoolers who didn’t like homeschooling– until I started asking others about their experiences. Growing up, I had a loving homeschool family. I felt, and still feel, like I was extremely blessed to grow up in the Christian family God gave me. I have fond memories of doing art class in the sun on our veranda, sketching and chatting about the Bible with no time constraints. Because of my positive experience, I could never understand homeschoolers who didn’t like homeschooling—that is until I started asking others about their experiences. 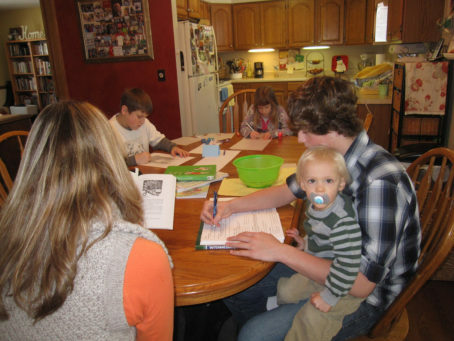 As I researched homeschooling, I interviewed many Christian homeschoolers. Although most had good things to say, few homeschoolers were as positive as I was. I soon realised my experience was not universal. Indeed, there were several people who spoke of abuse, legalism and abandonment by their parents. I even met homeschoolers whose parents had parentified them (parents who had used their older children as second parents to their younger children to the detriment of the older children). Homeschoolers who came from legalistic “Christian” homeschools were more common than I imagined. I was shocked. I didn’t want to accept that homeschooling wasn’t a panacea and I guess that deep down I thought Jesus saved people through homeschooling. Essentially, I thought as much of homeschooling as I did of God’s grace. But, my previous view of homeschooling isn’t a rarely held idea. From what I’ve heard, there are many people who think more of homeschooling than of God’s grace. In reality, they are relying on works, rather than grace. When children fail to see Christ amidst the hypocrisy and legalism of their parents, frustration builds and things can go pear-shaped. My heart bleeds for those who have had this experience. Perhaps along the way their well-intentioned parents lost sight of God’s grace amongst the day-to-day “work” of homeschooling their children. It is crucial to keep reminding ourselves that no matter how much work we put into raising our children in the way of the Lord, it is Christ alone who saves. We must not see God’s grace in our lives and attribute it to our (or our parents’) good works. Whether homeschooling or not, we must watch carefully for hypocrisy in our lives; if we don’t, then our children certainly will. Be wise and ready to hear them out on this because children often know their parents well. As humans, we are masters of hypocrisy. If you claim to be a light to the blind and a teacher who knows more than others, your children will notice your hypocrisy even more when you fail. 2. Don’t forget to listen to your children. Listen to see if your children are frustrated. As Ephesians 6:4 says, “Fathers, do not provoke your children to anger, but bring them up in the discipline and instruction of the Lord.” So often, disgruntled ex-homeschoolers describe their frustration as their parents simply did not listen to their concerns. This is a powerful form of neglect that does nothing to glorify God. 1. When teaching bible stories, point out the gospel truths so stories are more than moral tales of bravery, overcoming the enemy and so on. We need to make sure Christ is central and our children are hearing about his redemptive plan for them and for all of humanity. 3. Ask God for the strength to teach the gospel in your homeschool. Ask Him to keep you on track. There are many things to sidetrack us, so pray that we are vigilant. Gospel-centered homeschooling can be so fun and satisfying. Instead of relying on your works as you teach your children, rely exclusively on God’s grace, trusting in Jesus and telling Him all your problems. Jesus has done immeasurably more than we could ever do for ourselves when He died on the cross for us. That is a gospel worth teaching! Rebbecca Devitt is the author of Why on Earth Homeschool: The Case for Australian Christian Homeschooling. Rebbecca was homeschooled in a loving Christian household after attending a Christian school for two years.